This article was originally published on www.wheretheeffismyhandbook.com on 10.28.17. Me (on the right) with my best friend and college room-mate (on the left) while we were still feeling happy and empowered! I am a woman, I am 33 years old, I am a mom of 2 wonderful children, I am a business owner, I am a cancer survivor and a part time blog writer. I spend a large part of my life trying to improve my health, my body image and the way I feel. I do this with nutrition, exercise, vitamins, trying to control my stress and surrounding myself with positive energy. 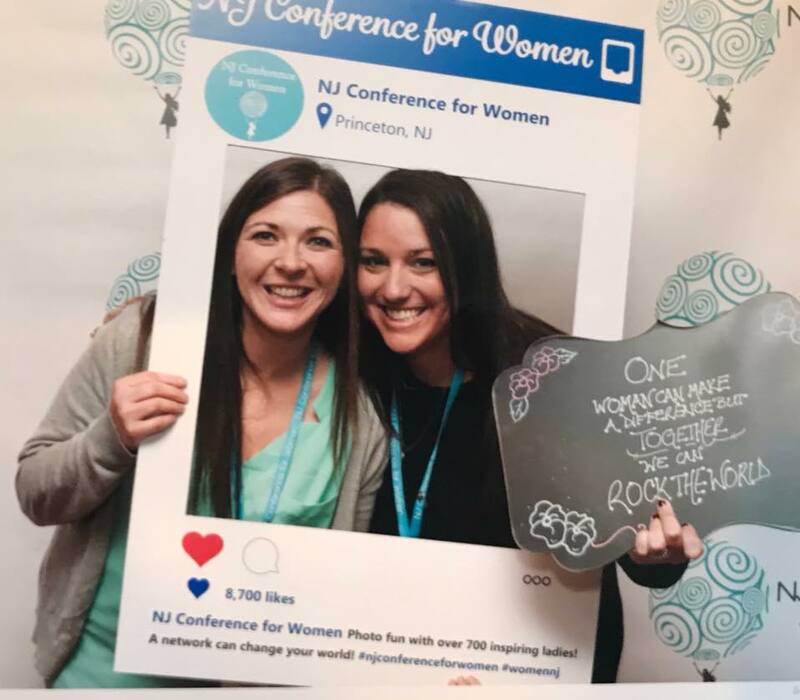 I recently went to a women’s conference. This conference brought together hundreds of professional women from all over. I was so impressed by the speakers and each attendee that I met. The environment was empowering and inspiring and motivating. Everything you would hope for this type of event. Well, except this one experience I had while I was there. Hello- first I wanted to tell you that this year was my first year attending the conference. I really enjoyed all of the speakers and found them to be inspiring. I left excited and motivated to try some new things in my business. I did have one small complaint that I felt was necessary to bring to your attention. In my industry, I am often looking for sponsors for events or people that would like to have a vendor table at an event. Therefore, I understand how sometimes it’s difficult to turn people down. That being said I thought I should tell you that I don’t think the plastic surgeon should have been there. I didn’t think of it at first… my friend and I walked passed their table, looked at the computer set up they had and kept walking. Since all of the tables seemed so great and had many exciting things to take or look at, we walked past them all several times. Well, one of the times we walked past the plastic surgeon’s table, he called us over. He asked if we were interested in trying out this cool program he had. So out of curiosity, I agreed. He began by asking me how old I was. I answered, 33. He looked at me with a strange face seemingly surprised and said, oh ok. I didn’t know what he meant. Then he took pictures of my face with a 3D camera. He proceeded to put my close up (unattractive) pictures on the computer and point out my issues. While I giggled and said I noticed the fine lines starting to show… He didn’t stop there. He said “Do you like this bump on your nose?” “Do you see these crows feet?” “What about this hanging chin”? He told me his wife is 40 and doesn’t have lines and wrinkles and she started Botox at 30-something. Anyway, long story short. I left that table feeling absolutely awful about myself. At a conference where everyone else was going out of their way to inspire, empower and make all of the women feel like the best versions of themselves. So then I began analyzing the situation in my head. I’m at an empowering women’s conference and I just had a man sit here and circle all of my physical flaws on my face (according to him)…. Maybe it was his approach that was all wrong. Maybe if he asked me if I had any insecurities that I was looking for a solution for and then showed me how he could help it would have been better. But I wasn’t the one to point out those flaws to him; he pointed them out to me. I just felt like the vendors and sponsors that are there should all align with as positive and powerful a message as your event and not let it contradict. This is just my two cents. Feel free to ignore it but I felt compelled to share because as wonderful as my day was and as much as I learned, the story I came home and shared with my husband and friends was this one. So, to this man who made me feel like crap at a women’s conference…. of course since this occurred I have day-dreamed about so many different ways I could have / should have handled this. I could have pointed at each wrinkle and told you that one was from the stress of cancer, that one was because I carried and delivered 2 human beings, that one was because I haven’t slept a full night since my daughter was born 6 years ago. But no, you didn’t need to hear that. Or maybe, I should have thrown the water bottle that I was holding at your face and told you that you might need some work now. No, that would have been crazy. I guess I could have asked you what gave you the right to tell me what my flaws were or asked you why I should care that your 40 year old (much younger than you) wife had no wrinkles. But I didn’t do any of these things. I got up, said “thank you, I’ve had enough” and walked away. I then, allowed your voice to stay in my head for the remainder of the day, the next morning as I stared in the car mirror at the lines you pointed out and later in the day when I looked closely at my nose … the part of me that might be the only part that never really bothered me. That was where I went wrong. I am a mom of two amazing children. I am a wife to an extremely supportive, wonderful husband. I am a full-time business owner (www.360creativeapproach.com), a part-time employee, a blog writer and a lover of all things creative. I sometimes obsess about and overanalyze the smaller details of life, because they are often easier to think about than the larger and more important issues. I am constantly amazed by how many incredible things people can do, while equally horrified by how many terrible acts people commit. I love to talk but I hate to hear myself talk. I am full of useless, random knowledge, and always thrive on learning more. My blog, www.wheretheeffismyhandbook.com, is meant to keep moms laughing and feeling supported along this crazy journey.